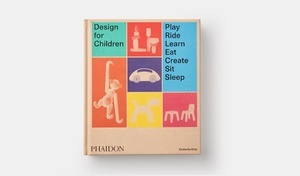 Book of the Day > Design for Children. Published by Phaidon Press. "Design for Children, a must-have book for all style-conscious and design-savvy readers, documents the evolution of design for babies, toddlers, and beyond. The book spotlights more than 450 beautiful, creative, stylish, and clever examples of designs created exclusively for kids - from toys, furniture, and tableware, to textiles, lights, and vehicles. Contemporary superstars and twentieth-century masters, including Philippe Starck, Nendo, Marc Newson, Piero Lissoni, Kengo Kuma, and Marcel Wanders, are showcased."